Seattle has a reputation for being a rainy city. This is true for some parts of the year, but there are times when you won’t see a drop of rain. Most of the rain falls during the winter months, so the months between May and November are the best time of year to visit Seattle. The summer months are very popular which results in lots of tourists and higher hotel room rates. Fall is a brilliant time to visit Seattle since many of the tourists have left, hotel room rates have dropped and the weather is pleasant. 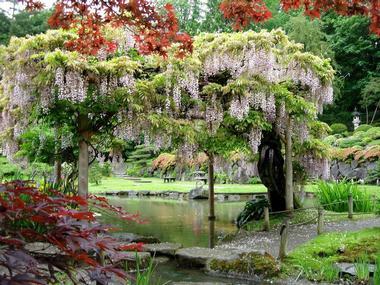 Spring is a beautiful time to visit, but you may still see some rain. January in Seattle comes with a chilly average high and average low temperature ranging between 47°F (8°C) and 37°F (3°C). The year also kicks off with the tail end of winter and the second to the least amount of sunshine in the entire year with a 69 hour average. In February, winter starts transitioning to spring bringing slightly warmer temperatures with it. The average high temperature creeps up to 50°F (10°C). On the other hand, the average low temperature holds steady at 37°F (3°C). Seattle Weather in March: Precipitation is at its lowest in the year during March with a 4 inch (94 mm) average. Meanwhile, the climate remains chilly but increases ever so slightly as spring officially begins. The average high temperature peaks at 54°F (12°C) and the average low temperature increases to 39°F (4°C). April is the peak of spring in Seattle and sees enjoyable sweater weather with average high temperatures of 58°F (15°C). The average low temperature remains quite chilly at 42°F (6°C). In May, temperatures increases to 65°F (18°C). Low temperatures also go up to 47°F (9°C) and vegetation is gorgeous during this time of the year. 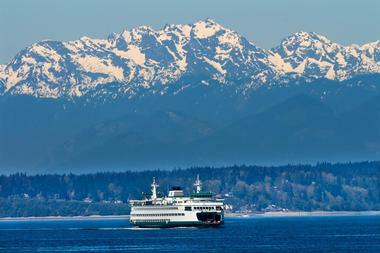 Seattle Weather in June: Seattle gets a lot of sunshine in June with an average of 268 hours. Summer also officially begins bringing with it 70°F (21°C) for an average high temperature. The average low temperature is 52°F (11°C). July is the warmest month of the year with an average high temperature of 76°F (24°C) and an average low temperature of 56°F (13°C). It’s also the driest month of the year with just a little over half an inch (17 mm) of rain. As the peak of summer, July gets 312 hours of sunshine - the most in the entire year. August’s average high and average low temperatures remain exactly the same as the previous month. Although it ties with July as the warmest month in the year, summers in Seattle are still relatively cool and enjoyable. August also has a low precipitation rate, receiving just under an inch of rain (22 mm). In September, the average temperature starts decreasing again as summer comes to an end. The average high temperature goes down to 71°F (21°C). The low temperature average to be expected is 52°F (11°C). Seattle Weather in October: There is a steep drop in average high and average low temperatures in October at 60°F (15°C) and 46°F (8°C) respectively. November is the wettest month of the year with a 7 inch (166 mm) average. The average high temperature drops further to 51°F (11°C). The average low temperature sinks to 40°F (4°C). In December, Seattle experiences the coldest month of the year with 46°F (8°C) as the average high temperature and 36°F (2°C) as the average low temperature. The start of winter also brings the least amount of sunshine to the city (52 hours). In general, the peak season for travel to Washington state is between the months of June through August with the shoulder seasons taking place twice in the year from April to May and September to October. Low season takes place during the colder months of November through March. When it comes to hiking and exploring Mount Rainier, the best time to visit is from mid-July to September when the weather is consistently dry, warm and sunny. For winter sports, the best time to visit is between late November until April. Food and wine in Washington, and Seattle in particular, is best during May while Seattle’s biggest food festival takes play in the middle of July. Whale watching season takes place between March and October while the flowers are best viewed during the spring time with cherry trees blooming in March. The Seattle-Tacoma International Airport is the main airport of the state of Washington. Most people arrive at this airport: there are more than 20 domestic and international airlines that fly into this airport from cities all over the world. Train lovers can take advantage of Amtrak’s services. Amtrak offers both train and bus service from Vancouver, British Columbia to Seattle. Its “Coast Starlight” runs from San Diego through Los Angeles, San Francisco, and Portland to Seattle. Both Greyhound and Bolt Bus connect Seattle to many cities around the country. By car many people take advantage of I-5, the main route from Los Angeles through Portland to Seattle. There are a variety of ways to get from the Seattle-Tacoma International Airport to downtown Seattle. 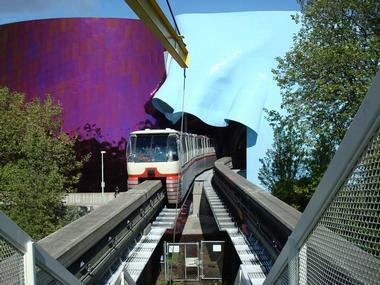 One of the most popular ways is the convenient “Link Light Rail” service. The airport station is connected to the terminal, trains leave for Seattle on a frequent basis, fares are very reasonable and the trip takes about 30 minutes. King County Metro Transit offers a bus service into Seattle, though it is somewhat less convenient and is slower than the rail service. There are car rental agencies at the airport for those who want to travel by car, and there are several taxi companies but the rates are high compared to those of public transportation. 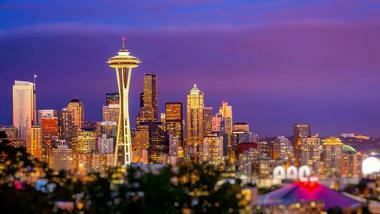 Once you arrive in Seattle you will want to visit one of its excellent tourist centers. Seattle Visitor Center and Concierge Services is located in the Upper Pike Street Lobby of the Washington State Convention Center. Market Information Center is located in the Pike Place Market. Both of these are conveniently located in the heart of Seattle. Another way to get information about visiting Seattle is to talk with one of the Metropolitan Improvement District’s Downtown Ambassadors. Dressed in yellow and blue, they make up an “on the street” concierge service. Another convenient choice is Seattle Visitor Information Center at 701 Pike Street. There are many options for getting around Seattle, and which one you use depends on what you want to see and do. Downtown Seattle is compact so a car is not needed: You can easily walk to see the major tourist attractions. While parking is expensive and difficult, you will need to rent a car if you want to venture outside of Seattle to visit any of its nearby sights such as Mount Rainier National Park. There are several ways to visit neighborhoods outside of the downtown area such as the Metro bus and trolley system, the Seattle Streetcar and the Seattle Monorail. Taxis are also an option. 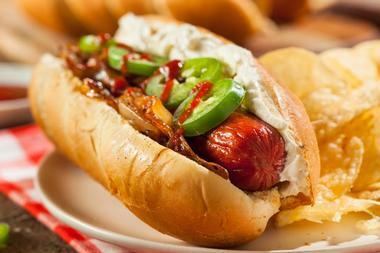 Seattle is full of excellent restaurants many of which offer local food from Washington State. It is famous for its fruit such as berries, cherries and apples, as well as its fresh seafood brought in from the waters around Seattle. For seafood, try Aqua or Elliott’s Oyster House located on the waterfront. Other good choices for seafood include Etta’s Seafood at Pike Place Market, Ivar’s Salmon House at Lake Union, or Salty’s on Aiki Beach in West Seattle. Pacific Northwest restaurants include Lark or Poppy’s at Capitol Hill, and Miller’s Guild and Urbane, both Downtown. There are also many ethnic restaurants options such as Asian, Chinese, Italian Japanese, and more. Visitors enjoy the variety of shopping that is found in Seattle. In the downtown area, there are large stores such as Macy’s, Nordstrom and Tiffany & Company. Other department stores include Eddie Bauer, Filson and REI. There are several shopping malls such as Pacific Place and Westlake Center. Outlets include Centralia Outlets, North Bend Premium Outlets and Seattle Premium Outlets. 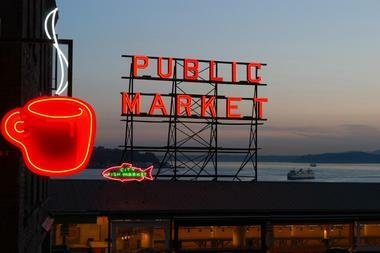 For souvenirs, head to Pike Place Market and the Waterfront. Belltown is the area to explore if you are interested in buying art. If you are looking for boutique chic, there are many small and unique shops along Ballard Avenue. 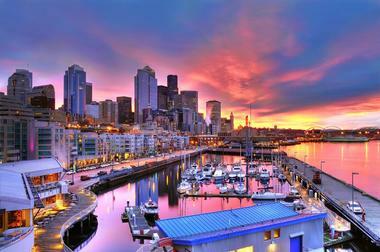 The city of Seattle is made up of a large number of interesting neighborhoods. 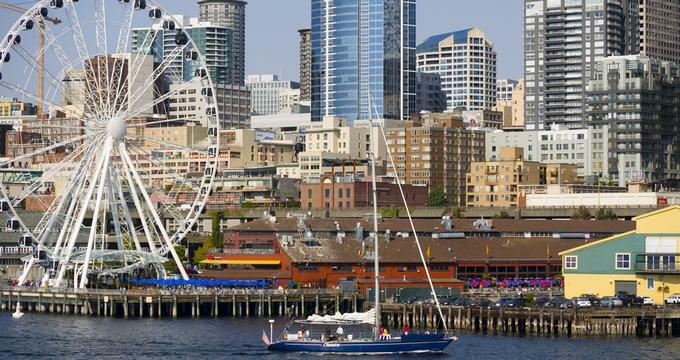 Many tourists focus on the downtown area because this is where many of Seattle’s attractions are found such as Pike Place, Pioneer Square, Seattle Art Museum, Chinatown, The Paramount Theatre and more. 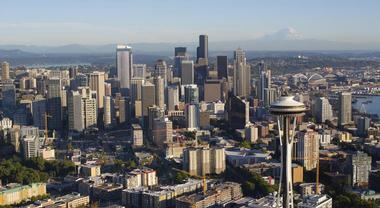 The Queen Anne District is north of downtown and is home to Seattle’s iconic Space Needle. West of the Queen Anne District is the Magnolia neighborhood with its Discovery Park. 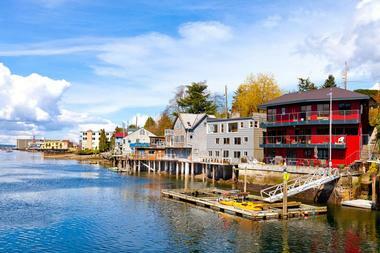 Across Salmon Bay from Magnolia is the Ballard District with historic landmarks like the Ballard Carnegie Library. Northeast of downtown is the Capitol Hill and Central District full of Seattle’s oldest Victorian mansions. Seattle is a popular place for weddings. Judges at the Seattle Municipal Court are able to perform marriage ceremonies. The Hyatt at Olive 8 in the downtown area of Seattle offers great views, ballrooms and intimate spaces for ceremonies, receptions and rehearsal dinners. Another popular hotel venue for weddings is the W Seattle Hotel. The Seattle Asian Art Museum, built in 1933, is a beautiful property and hosts weddings and receptions. The Seattle Art Museum is another good choice. If you are looking for an outdoor setting, the Ballard Bay Club has spectacular views of Puget Sound as well as the Olympic Mountains. Seattle offers a full range of accommodations. There are many upscale hotels in the downtown area of Seattle, though the room rates for these hotels are generally high. Around downtown and the Pioneer Square district, there are many interesting historic hotels. 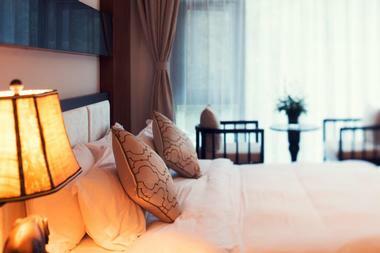 The rooms in the downtown hotels tend to be small, so if you are looking for more space, it’s a good idea to check out some of the neighborhoods outside of the downtown area. There are many Bed and Breakfast accommodations in the Capitol Hill area, some of which include the Bacon Mansion, the Gaslight Inn and the Shafer Baillie Mansion.